Here's another classic Roll-A-Story. 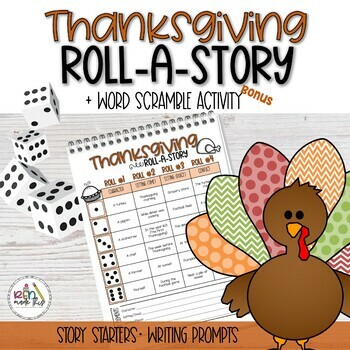 This fun resource is perfect for any classroom looking for a little writing inspiration on Thanksgiving. Students simply roll a dice to determine the story elements (character, setting, and conflict) that will debut in their original narrative! These perfect story starters get students thinking out-of-the-box and writing creatively. Perfect for a fun literacy center activity or try grouping students to write collaboratively. NO PREP, JUST PRINT & WATCH THE MAGIC UNFOLD!